NOTE - Following is based in part on conversations between Leo and his son, Frederick, in December 1983. 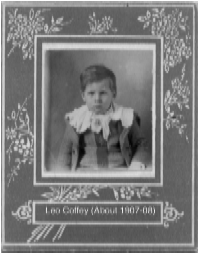 See also the file on Newton Coffey (his father) for more information on early childhood. 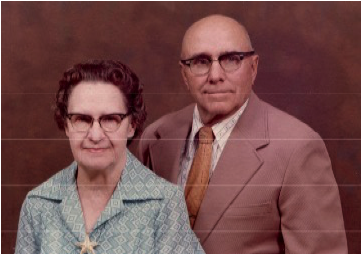 The family moved to the Moody Robinson farm 3 miles south and 1 mile west of Humeston when Dad was about 8. They bought the place when Grandpa Moody moved to California (see Moody Robinson). They lived there until after Dad and Elsie were married. Dad went through 8th grade in Green Bay country school. When it came time to consider high-school, brothers Bill and Carl had just gotten drafted into the army and were expected to serve in Europe. So Dad decided it was necessary to stay and help his father with the farm. However when the Armistice was signed ending the war, Carl & Bill got notices to stay home, but the school year was already well under way. Leo had also missed one year in grade school, due to complications from a case of the mumps. The worst part was having to take cod liver oil with each meal! 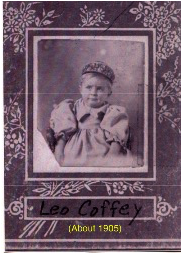 His father, Newton Coffey, and uncles Ben & Clyde owned a separator (thrashing machine) between them, and for a while Leo earned money hauling water for the steam engine that powered the separator, using a team and a tank wagon. However he preferred husking corn - he got 8 cents per bushel, and could do 90 or 100 bushel on a good day. It was much more profitable than hauling water. Leo and his brother Carl also farmed together for 2 years, on 320 acres of rented land. 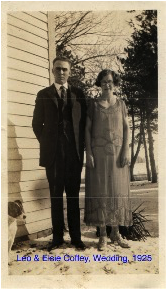 Leo and Elsie were married for the first time on December 31, 1924 - but discovered that it was not allowed to get married in a different county from the one in which the license was issued! So they did it again on January 6, 1925! Leo wanted a farm of his own now. And Everett Walker, Elsie's father, was also discontented with his present farm. Both talked to the same real-estate agent, and both decided their future lay in the area around Farmington, Iowa (in the far-south-east corner of the state). Actually, Everett bought his land just across the border in Missouri. Leo had only a little machinery, so had to borrow for the farm and stock. It was 120 acres of rough land. Leo drove Everett Walker's car to Farmington, and Everett took the train with all his horses (including the Pony, Rex - see biography on Elsie) and machinery. 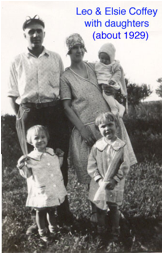 He started farming with one black team and a 16-inch walking plow. The first year he was able to plant 30 acres of corn, and 3 acres of cucumbers (which were sold to factory in Farmington). He also worked part time in a saw-mill during part of the year. The saw-mill was steam-engine powered. By the fourth year on the farm, he was able to buy his first tractor, a Fordson. He was also able to buy a wood saw to mount on the tractor, and was able during certain parts of the year to earn $1 per hour, sawing wood. The saw cost $25, and was paid for in 3 days. As was the case with so many farmers (and others) at that time, the farm was bought with nothing down. When the Depression began in 1929/30, both the farmers and the banks went under. Leo's fate was no different than the others, and the farm was foreclosed by the bank receiver. 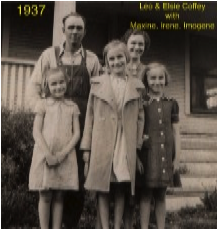 About 1931 he began to work for Elmer Lovett, walking from town out to the farm. He started out at $60 per month, but the depression got deeper and the farm kept losing money. The pay dropped, and finally got down to $7.50 a week! Even this was not full time, and he shucked corn for John Byerly and others to fill in the gaps. After a year in the house north of the school, they moved to the "Kentner House", a few blocks east of the school. The first year the rent was $10 a month, but as the depression deepened the rent was lowered about every year -- in the end it was down to $5 per month. Out of the $7.50 per week came about $5.00 per month for rent, $1 for electricity; the rest had to cover such other necessities as food and clothing. There was always a family garden as well to help with food. Even so, they were able to buy a new, gasoline-powered washing machine from Rolly Leonard's store. Payments were $1 a week, and very few were missed. Rolly always understood if it were necessary to delay one. 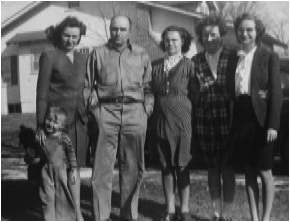 After 5 or 6 years in the Kentner house, they moved (in 1937) to the farm east of town for a year (rent $75/year), then in 1938 to the big brick house about a mile East of downtown Garden Grove, and then in 1941 to a house in "Burr Town" (Garden Grove's equivalent of the "wrong side of the tracks"). After working for Elmer for 8 years, he worked for the Arnold brothers for a year in 1940 (the pay was a dollar fifty per day). In 1941* he got the opportunity to take over the Garden Grove Produce Station. Curly Comegys owned it, and guaranteed that if he couldn't make $12.50/week from it he would make up the difference. The first week came out exactly $12.50, and things improved from there. Sometimes he was able to make $75 or $100 per week. He bought cream on commission for Swift & Co, got 30 cents per case commission on eggs, and got 1 cent per pound for poultry. He stayed in the business for 23 years. In addition to running the produce station, he found time for community activities. He was active in the Garden Grove Methodist Church. He was active in the Chamber of Commerce, was elected to several terms on the Garden Grove City Council, and was Chief of the Garden Grove Volunteer Fire Department for several years. (Even in his later years, when he felt he was too old to take an active part in fighting fires, he was still counted on as the only person who could reliably coax a flow of water through the old pumper!) When the city got a public water system, he also picked up the role of managing and maintaining the equipment. After two more houses (the "Landrum" house, and the "Smith" house - where Frederick began to grow up), his present house next to the library came on the market in 1949. Rolly Leonard, who owned the furniture store, suggested to Leo that he buy it, and offered to carry a mortgage. The house cost $2300 with $500 down. Leo promptly re-built the plumbing and began to dig out a basement by hand. His father Newton helped with some of the work, but did not do the digging. He also lowered all doors, windows and ceilings, and put in a propane furnace. The old barn on the property was sold for $85, and after it was removed the whole lot was planted as garden. Gradually the garden retreated over the years, and most of it became a beautifully maintained orchard. The grape vines, which still thrive on the property, were there when the house was bought, so they must be well over 50 years old. After the produce station became unprofitable in the mid-1960's, there were a couple of years working at farm labor and miscellaneous jobs. Then he began to work as janitor in the LeRoy school, where he remained until retirement. 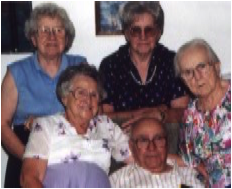 In 1995 (at age 94) he became unable to maintain his own house, and moved to the Leon Care Center, Leon, Iowa. All of his children visited as frequently as possible, and made a special effort to be there for birthday celebrations. 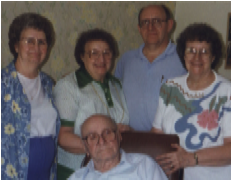 All were there to help celebrate his 96th birthday in 1997. Sadly, daughter Maxine died in November of that year. The Leon Care Center was sold in 1998, and he moved to the Lamoni Nursing & Rehabilitation Center. There was a Coffey Reunion in June, and he was delighted by the attention of his descendants and his sisters. He died on October 26, 1998 after a brief illness, at the age of 97, and buried next to Elsie in the Garden Grove cemetery. Leo married his love, named Elsie. Made farming a vocation he sought. To begin their life together as one. And a sixteen inch walking plow -- so keen. Became a part of Leo and Elsie’s team. Dad bought his first tractor -- a Fordson. The bank foreclosed and the Model T became a van. As a farm hand he labored for $60/month - without fail. Shucking corn for others -- a part time job he did seek. Opportunity’s door opened at Garden Grove Produce. Who promptly began to spoil him rotten. It became unprofitable -- time for a change. Retiring at age 72 -- the rule. Much work for he and his wife. An orchard became his hobby at last. Exciting for great-grandchildren, who won’t forget. Was much fun to ride behind tractor in wagon. Dad’s patience with children went on and on. They saw many sights is 48 states. Four children, 12 grandchildren, 21 great-grands, and 5 great-great grands near. A sense of humor wherever he went.